Every society has its secrets. 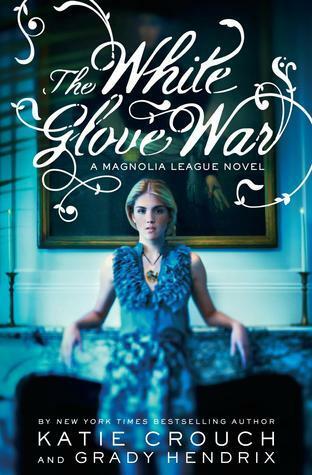 The members of Savannah's Magnolia League have it all: money, beauty, power, and love. Some may call them lucky, but we know better. Spells, potions, and conjures are a girl's best friends, and thanks to the Buzzards -- a legendary hoodoo family -- the Magnolias never run out of friends. Golden girl Hayes Anderson would never dream of leaving the League or Savannah, where there's no problem that can't be fixed with a cup of Swamp Brew tea -- served in a bone china cup, of course -- and no boy who can't be won over with a Conjure Up a New Love spell. But when danger lurks and family secrets are unearthed, Hayes discovers that her life may not be charmed after all. Don't miss the second novel in Katie Crouch's enchanting and mysterious Magnolia League series. I think it is important to know that this book is told from two separate view points and narrators. I didn't realize that and was INCREDIBLY confused for the first few chapters- totally my fault, but I thought it would be good to point out. The narration of the story switches between Hayes and Alex (the first book centered around Alex alone). It was interesting to get to read the story from two different girls who played main roles in the story. I have to say, I was pretty creeped out by this story as it went along. I hate ghost stories- and that is what this story became. It was super creepy- much more than the first book. I found the focus to be less on the Magnolia League in this book, and more on the creepy paranormal happenings. There was also little to no romance in the story- it was only briefly hinted at at the very end of the story. Although this book gave me the heebie jeebies- I really did enjoy it, and much more than The Magnolia League. The author has woven so much history about voodoo and hoodoo magic into the book- it is incredibly interesting to read! This was a fast read for me (less than 2 hours) and was an enjoyable jump back into the story of Savannah Georgia. The book was left wide open (and I mean broad side of the barn wide open) for the third book in the series- and I am eager to see Madison take on a more central role in the book. If you are interested in voodoo, magic, or a good Southern tale- check out the Magnolia League series.